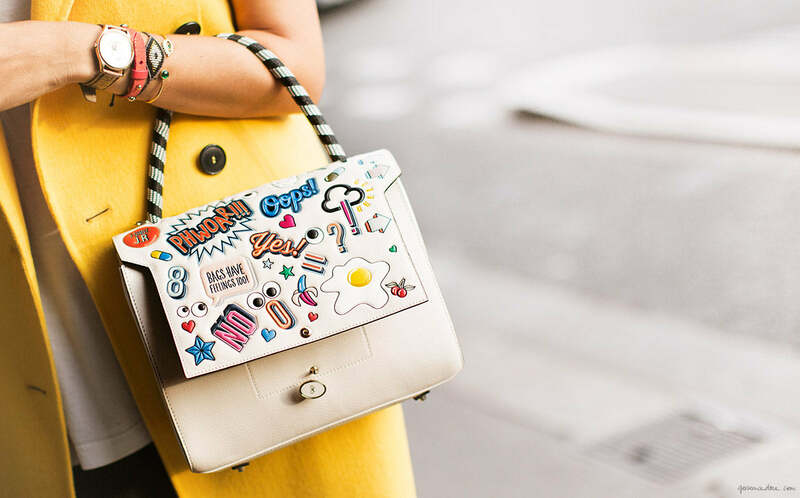 Repéré sur les podiums P/E, un des sacs à stickers d’Anya Hindmarch— vous vous souvenez des stickers en cuir qu’elle a créés ? Je crois que ce que je préfère dans ce sac, c’est qu’il me rappelle les cahiers que je recouvrais de stickers et de graffitis quand j’etais ado. Un peu de nostalgie, ça n’a jamais fait de mal à personne, si ? Love this bag, so funny! I am totally in love with this bag! It reminds me of the same thing! How cute. Oui, au côté funny de la mode ! Almost too much so for me! Sometimes trendy— is just trendy. It is darling. For some reason it brings to mind the Kate Spade Chinese takeout box purse. It’s cute in the same way. So charming that bag is. It made me think of the beautiful Dior bag you created a video about…. You know… The bag that you took around Tokyo and had the people you met along the way decorate it with stickers, paint and tassles. These two bags would look so cool on a table – side by side. What fun! That bag would make me happy just carrying it! What a cute and funny bag! Great if you do still go to school or have done so in the past five years, a bit silly and fashion victim-y for most people over 30. Way too junior high looking for this grown person! wonderful bag, i love it!! Well, that’s just adorable! A smidge busy for my taste, I wouldn’t be able to afford something in this price point that I couldn’t wear every single day. This can go on my « when I have a million dollars » wish list. I love the idea!! !It’s not only a funny trend but also another way to express something else about our personality! I usually adore what you post…but I can do without this bag. Too childish…I would use that word rather than whimsical to describe it! Love this bags designed by « Anya Hindmarch ». She’s very creative and most important love the idea of personalization.